Below is a poll from Colmar Brunton on where voters would like the transport dollar to be invested. Above is some reactions in regards to climate change and how a four lane duplicate highway does not exactly stack up in fighting climate change that much if at all. create a passenger rail service linking Auckland, Hamilton, and Tauranga and, if justified by demand, upgrade it in stages to a rapid rail network throughout the Golden Triangle. Develop a Congestion Free Network plan and fast-track a feasibility study on rapid transit to the airport, which considers light rail. Instruct Kiwirail to retain an electrified network between Hamilton and Palmerston North and work on an evidence-based plan to progressively electrify other key parts of the network. Re-open moth-balled railway lines where community and business support exists, and there is evidence that the service would be sustainable, notably the Napier to Gisborne rail line. investigate a rail line to Marsden Point and Northport and upgrading the North Auckland Line to take pressure off the roads in Northland. make more funding available for transport projects of regional importance by doubling the funding range of $70-$140m to $140-$280m. make the process of building a new road as quick as possible to restore a quality link. Make investments from the National Land Transport Fund on a mode neutral basis, meaning that rail and walk/cycle projects will be eligible for funding where evidence shows clear benefits to the transport system and local communities. make it easier and safer to walk or cycle in our communities by committing more funding to urban cycleways, active neighbourhoods projects, and the Skypath on Auckland Harbour Bridge. Our full manifesto document is available here. Take a look at the two transport polices from the major parties then go back to the poll at the top of the post. This poll was done well after both National and Labour had announced their transport policies so those polled have had time to have a think. 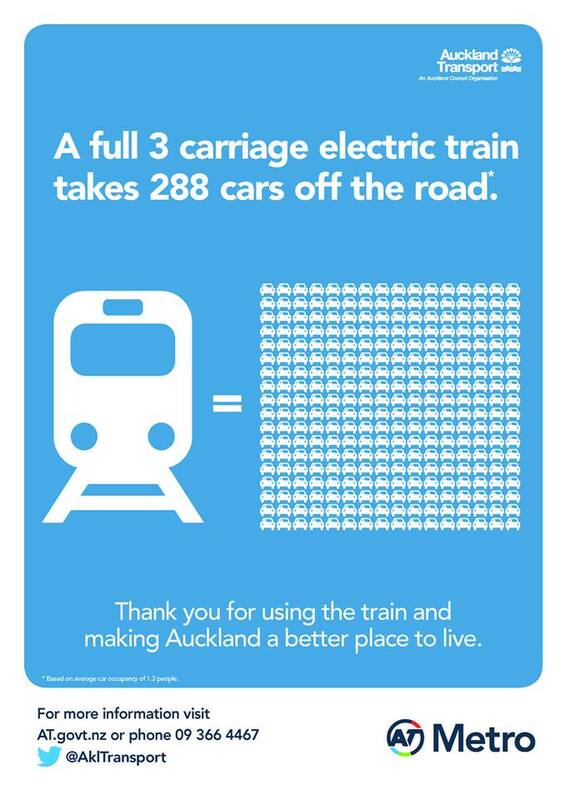 In short though it seems National is on the road to madness with its 20th Century roads first policy while Labour is to engage more inline with what voters are wanting – transit and active modes. 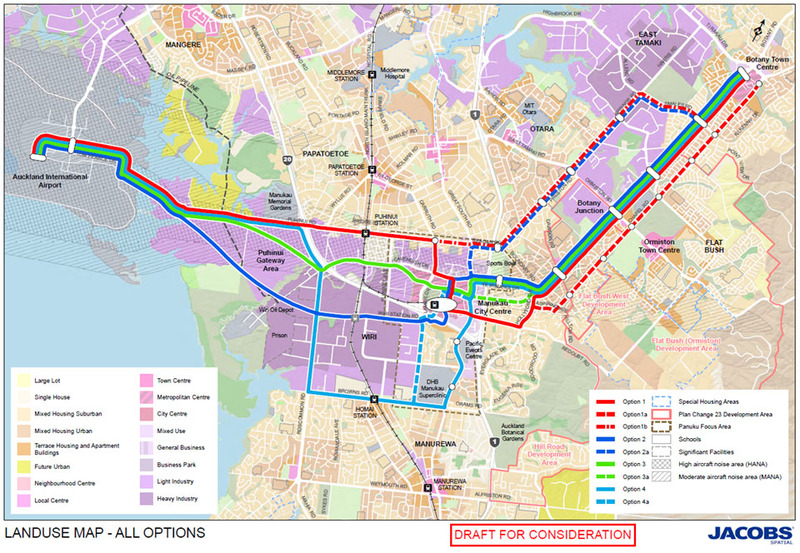 This does not mean the Mill Road nor East West Link corridors will miss out but rather scaled back. 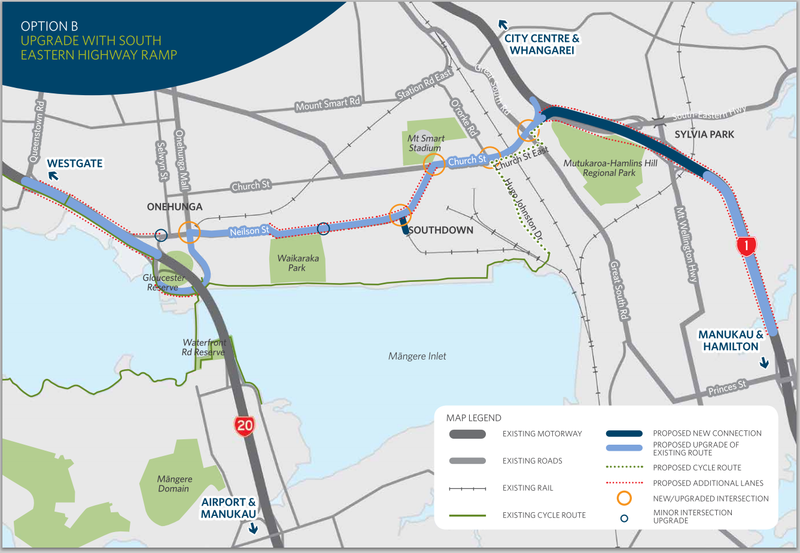 With East West Link Labour have said they would scale it back to most likely Option B that comes in at a third of the price of the current proposed Option F. Mill Road is divided into two sections – north and south. The southern end of Mill Road (Dominion Road, Papakura to Drury Motorway Interchange) is in urgent need to be done to get the trucks off Beach Road in Papakura while still servicing the Drury South industrial complex. The northern end of Mill Road (Cosgrave Road, Mill Road and Redoubt Road) is not due for 4-lane-ing (you can thank Councillor Daniel Newman for for putting the Porchester Road to Mill Road Future Urban Zone land back to the third decade for development thus killing off the demand) but rather basic safety improvements such as kerbs, a new viaduct to the east of Totara Park, a new roundabout at Murphy’s Road and preparation for the Southern Airport Line which runs down Redoubt Road from Holyford Drive to Manukau City Centre. 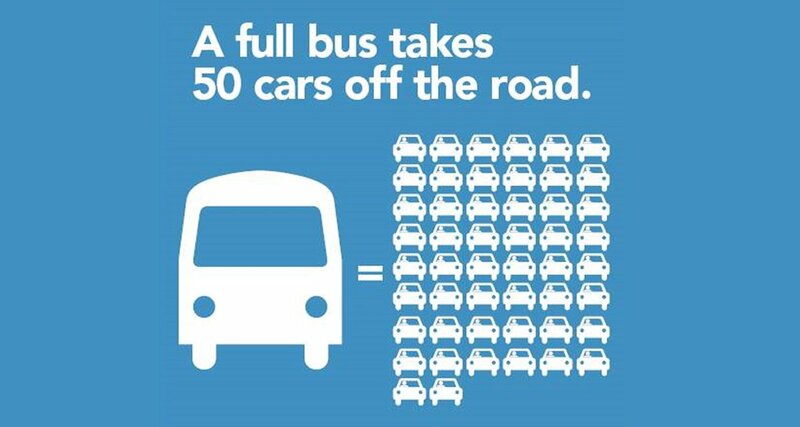 Something is not stacking up with National’s transport policies. Rather sadly more than ironically the fiscal hole National’s transport policies is larger (and actually real) than Steven Joyce’s imagined fiscal hole he was trying to find in Labour. 64% want more investment in transit. I say let’s give it to them!